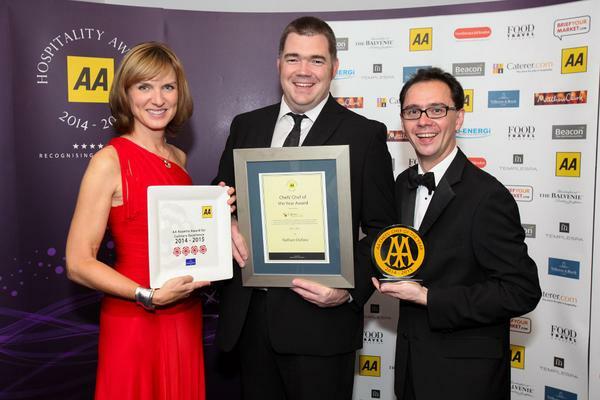 This year’s AA Hospitality Awards were held at Grosvenor House Hotel on Monday 22nd September and there were smiles all round for Nathan Outlaw as he was named the AA’s Chef’s Chef of the Year. The AA said Outlaw had come a long way from his childhood helping his chef father with breakfast service in Kent. The award recognised the fact that since opening his first restaurant, in Cornwall, at the age of 24, he has become a firm fixture in the restaurant world as well as on TV screens, and is now helping chefs of the future at the Academy Nathan Outlaw. The title of Hotel of the Year in England went to Dormy House in Broadway, Worcestershire, while the winner in Wales was Ynyshir Hall in Machynlleth, Powys. Mendrum House country hotel in Aberdeen picked up the title for Scotland, with the Bushmills Inn hotel in Bushmills winning in Northern Ireland. The Rosewood won in London. The title of AA Restaurant of the Year went to Sticky Walnut in Chester, with Bully’s in Cardiff winning for Wales, and Timberyard in Edinburgh for Scotland. The London winner was Berners Tavern.